A while back, I got into a conversation on Twitter with Simon Spanton (@SimonGuy64) of Gollancz about frightening books. In terms of 'frightening' I was right out of my league. It takes very little to make me put a book aside or cover my eyes. I know this so I avoid anything that will make me even mildly apprehensive. Some people like being frightened. I don't. Perhaps I was frightened too young to gain any pleasure from it. There's a particular book which did the damage. I first heard it read when I was three and the horror it induced has stuck with me ever since. And it's so frightening I haven't dared even throw it away. It has a hold over me. If I got rid of it it would still lurk in my just-below-consciousness. I have to have access to it to check every so often that it isn't even worse than I remember. It isn't. But then, it couldn't be. And the book has a life of its own. For all that it's important to me, for all that I could never give it away, it vanishes for years on end, then resurfaces. At the time of the conversation, I couldn't find it. I searched my bookshelves. No. Not there. Then, a couple of months ago I found it in a cupboard. I don't know what it was doing all mixed up with my art things and jam-making things and passports and ancient school certificates - but that's what frightening things do - they lurk. The book? 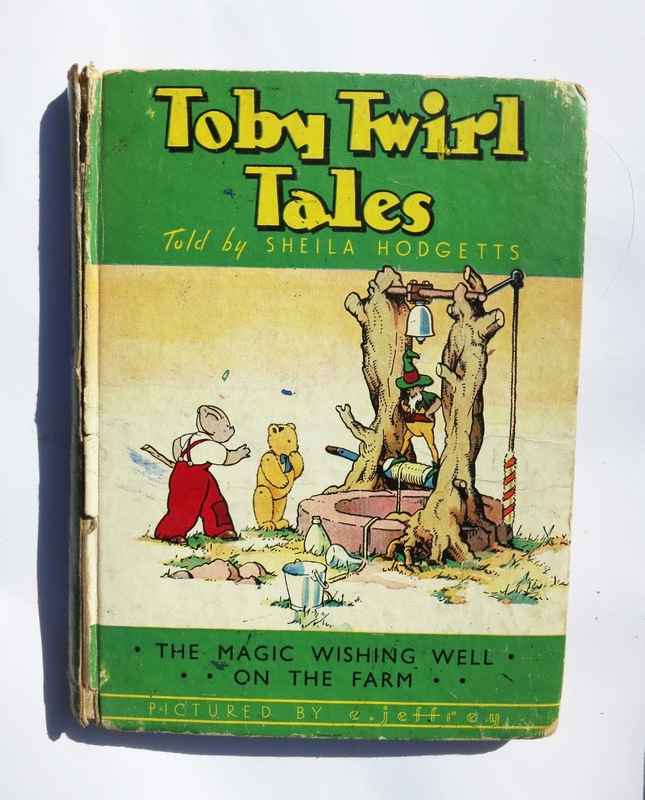 Toby Twirl and the Magic Wishing Well by Sheila Hodgetts. (There's a farm story in there too but we can forget about that.) The story is pretty dire. 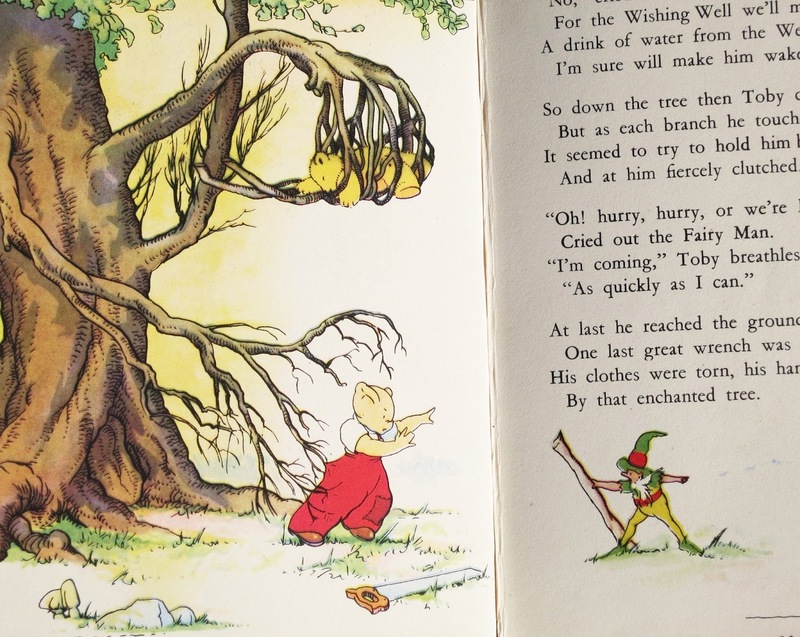 Toby Twirl (who turns out to be a pig in red dungarees but I was never sure what he was when I was little) has a Teddy Bear friend who falls into an induced sleep and is captured by the branches of an enchanted tree. They fold around him forming a cage which hoists him, comatose, high above the ground. Toby narrowly escapes the same fate, clothes torn by the grabbing branches. A Fairy Man takes him to a magic well and . . . . It's a complex tale . . . we'll leave it there. This illustration may give you an idea of the terror involved. And when I say 'terror', I do mean terror. It still makes me tense up and worry. Childhood traumas are well known for having the power to influence our adult lives - and many children undergo much more serious challenges than being read a frightening story about a pig, a teddy bear and a pixie. I'm fortunate I didn't have to face up to much worse. But, given that the fear remains, does it influence my relationship with trees? What is the most frightening book you have ever read? And can you let it go? Although the 'ready, steady, go!' moment for Tree Following will be on 7th March, several Tree Followers are already introducing their trees. Val, at Pencil and Leaf has begun with her Village Horse Chestnuts. I grew up in a world where there were snakes and geese under my bed and the boogie man in my closet. It really takes a lot to scare me, but my top two are The Shining and The Haunting of Hill House. It pretty much canceled out all those fairy tales with happy endings. I was only six, but I'm sure even now I couldn't watch it without getting very upset. I remember being terrified of the Red Room in Charlotte Bronte`s Jane Eyre. Jane was locked into the supposedly haunted room by her cruel aunt. It gave me nightmares. Great post - glad it didn't ruin your relationship with trees! I can't recall being that terrified, but there was a real creepiness associated with Rupert the Bear stories - which remind me a lot of your Toby Twirl tales, in terms of the illustrations. I don't remember being frightened by books at all, and loved Toby Twirl, though I was always wanted an explanation of what the differences were between all kinds of "little people". Arthur Rackham's illustrations have always rather spooked me though. Oh my gosh, as if childhood didn't have enough normal frights, they had to go and write nasty children's books on top of that. Ack, there were a couple of space movies with Aliens, and people disappearing into holes in the ground, black and whites. Along with one of a old mansion, a giant toad that hopped along the hallway and tried to eat people...I still want to find them, and see those again, lay those nighmares to rest. I vote for selling the book to a antique dealer, that way you can put the funds to good use, and feel better about it. Impossible to say really which books have frightened us most, for we are total cowards at heart, but for sure there are many!! The illustration of the teddy bear trapped in the tree is most disturbing particularly so as we have ancient Teddy who accompanies us to the ballet, opera and concerts in general. We have found your blog quite by chance and are captivated not only with what you write but also you do live in the most wonderful county. Lyme Regis remains an all time favourite place. We have signed as Followers. If you need to know anything about us, then we are simply a click away. Oh my! That does sound frightening, especially for a young child. Hmmmm, I know a lot of movies scared me. For example, the witch and the monkeys in "The Wizard of Oz." I'm sure there were books that scared me, too, but in a more subtle way. Kind of like a "this is what can happen to the world when people make various choices" kind of way. One book that did that for me was, "The Little House," by Virginia Lee Burton. Hello Countryside Tales. There's information and a list of participants on the Tree Following page. On 7th March there will be an opportunity to leave a link to a tree following post so others can read about your tree - so if you can choose it and post about it before then and visit Loose and Leafy on 7th with your link, that would be good. If you're not used to linking through linky boxes - it's very clear when you come to do it. Metamorphosis. The man who turned into a beetle. Hello Hollis. I had to look up Old Yeller as I'd not heard of it. If there's a story in which everything that can goes wrong goes wrong - that's it! However, in terms of lessons learned, it reminds me of The Yearling - a book I both enjoyed and was disturbed by when I was little - the young deer has to be killed because it eats the crops. If it eats the crops, the family will starve. Hello Dartford Warbler. The Red Room! Yes. The whole first section of Jane Eyre is appalling. It wasn't just that her aunt is a reluctant foster parent - she's actively cruel. Hello Pat at Squirrelbasket. The power of illustrators is great. The rhyming text of Toby Twirl is awful, The real terror comes from the drawings. I was puzzled by Rupert but liked the stories and, unlike you, the illustrations too. On the other hand, when I looked up 'The Singing Ringing Tree' (which I'd not heard of before) I found it compared with stories of the Brothers Grimm - which were, indeed, grim and terrifying. Didn't like them! where the blogger is talking about the use of brown in painting and has a couple of Rackhams pictures of trees coming to life in a really scary way by way of illustration. Hello Flighty. I've not read Edgar Allan Poe. I wonder if I would find it frightening or funny. Crime stories - I enormously enjoy detective stories where the crime is solved and good prevails, order restored, cruelty invisible and gore concealed. Very reassuring. Oh Jen! I'm beginning to regret having asked! Now I too will be haunted by the idea of a giant toad prowling corridors and out to get me! Hello Jane and Lance. Glad you've found Loose and Leafy. Yes - I'd like to know something. Why do you take an ancient teddy bear to the opera? Hello Plant Postings. 'The Little House' - another book/film I've not heard of before. Reading about it on your link - it looks fascinating. When the house is relocated - is that a happy ending or a note of despair as the peaceful retreats? You mention the way choices people make can be frightening. For me, inevitability is even more so. Hello Diana. I've not read any Kafka but the very mention of his name makes my skin creep. Yes, Lucy, I would say feelings caused by Old Yeller and The Yearling are very similar. Thx for starting this very interesting discussion btw. Had a (very battered) copy of that one in at Oxfam today - I remarked to my colleague that it was a book that scared me witless as a child. The illustrations were what did it - all those humanoid animals and, of course, the grasping trees. Glad to know that I wasn't alone in my terror.. This book has been on my mind for many years and I have had this image of poor Teddy clenched in the branches of a tree in the back of my psyche since the 1950s. Now you have reminded me of exactly which book it was, so I can buy it online and re-read it.